Do not work under this! Here in West Michigan, the winter weather can take many twists and turns on its way to spring. In just days, the weather can go from 50 degrees to 5 degrees and this creates extra hazards for outside craft folks. One of the most dangerous is icicles. 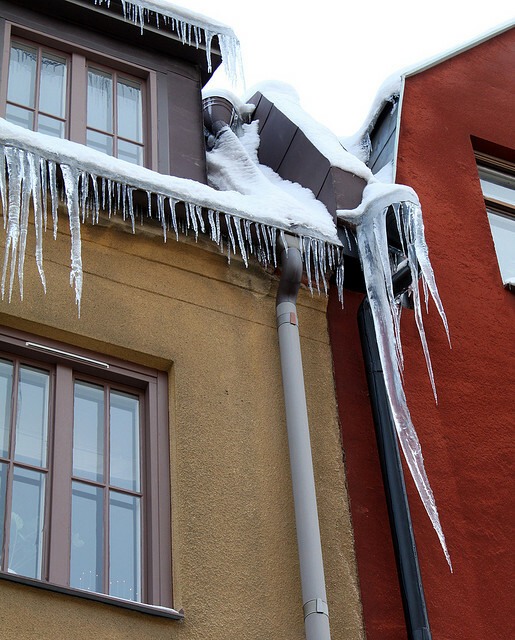 The freeze and thaw cycle during weather-swings can cause these to both grow rapidly and weaken to the point where any disturbance, such as opening a network interface device (NID) on the side of a house can cause it to come crashing down – on you! In our Local, we have had a technician end up with a cracked vertebrae when he was caught by one of these icy missiles. While that is a serious injury, it could have been worse. He heard it crack loose and was running away from the side of the house when it struck him in the back. Though he was wearing a hard-hat had it hit him in the head, he may have been even more seriously injured. If dangerous ice is hanging over your work area, do not approach! Instead, call your manager and inform them of the unsafe work-area. Managers are required to physically examine the unsafe work-area unless they tell you to return the job and leave the area. Do not work in unsafe areas! You cannot be disciplined for refusing to work in unsafe areas or conditions! Inform your steward if the boss gives you unsafe instructions.